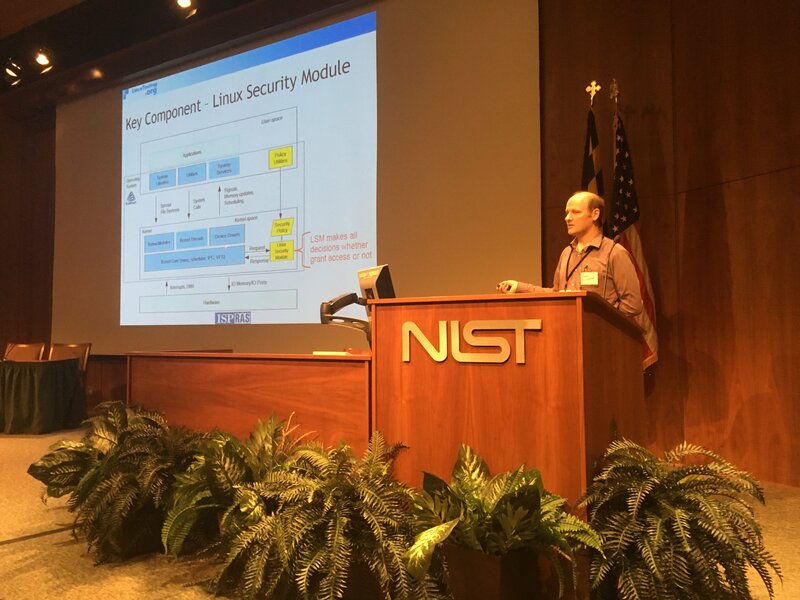 Alexey Khoroshilov presented the experience of Linux Verification Center in proving sequential properties of unmodified Linux kernel code using Frama-C with AstraVer plugin at Sound Static Analysis for Security Workshop held at the National Institute of Standards and Technology (NIST) in Gaithersburg, Maryland, USA, on June 27-28, 2018. Verification of legacy code often means that you have no ability to fix the code to simplify its verification. As a result verification tools have to support many complex corner cases in semantics of the target programming platform, most notably in low-level platforms based on C programming language that lack well-defined semantics for many cases widely used in practice. That was the reason for building AstraVer plugin to Frama-C that tries to solve this problem by implementing support for C code used in Linux kernel. The first target for the AstraVer plugin was a custom implementation of Linux security module that is a component responsible for implementation of access control policy. Another target was a set of unmodified Linux kernel library functions implementing conventional memory and string operations.